Enroll by May 20, 2019 and save $200.00! Painting in the landscape requires a unique combination of left and right brain thinking. We have an emotional, intuitive response to a scene, yet we need technical control and accuracy to convey our concept to paper. This workshop will focus on how to identify, clarify and convey your initial emotional response, and bring it to completion without losing the immediacy and vibrancy of your vision. More than other mediums, a pastel in the hand can bridge the gap between left and right brain involvement in the creative process. They are immediate, direct and tactile, require no delay or premeditation for mixing, and can be used both for intuitive quick drawing as well as for more strategically planned work. In this workshop, we will learn to focus on our emotional reaction to a scene, quickly create workable compositions, and then hone our skills to complete a painting in plein air, while maintaining the initial clarity of intent. Students will be encouraged to paint loosely and boldly, and to work intuitively with the medium. The workshop is suitable for beginners, intermediate or advanced students, as well as people working in other mediums who might enjoy playing with the mark-making potential of the pastel. The workshop is suitable for beginners, intermediate or advanced students, as well as people working in other mediums who might enjoy playing with the mark-making potential of the pastel. the joy of painting en plein air in a relaxed and inspiring atmosphere with the expert instruction of a nationally known artist and instructor and the camaraderie of a small group of learners. and from Cortona on May 27, 20207; times to be announced. Molly has hitchhiked across North Africa, and lived for months on a beach in Marrakech, Morocco, and in Corfu, Greece. Her jobs have included working the counter in Kentucky Fried Chicken, selling magazine subscriptions, counting nematodes, studying the infection characteristics of measles, selecting the location for General Motors Saturn plant, designing playgrounds, managing construction, and providing real estate investment strategies for the country’s largest investment banks. She has been a professor at Pratt Institute, Marymount College and Touro College. 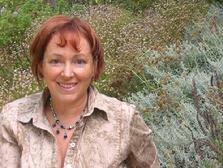 She currently lives in Mission Viejo, California where she paints and writes award winning poetry. 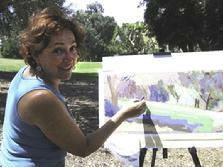 She shows her work in New York and California, and teaches landscape painting workshops for pastel. She is an Artist member of the California Art Club, and a signature member of the Pastel Society of America. “I believe all objects and places have a “voice”, or a dynamic way of being. Everything, at some level, interacts with and within its environment. When I stop to observe, these objects and places are animate, energetic, and changeable. My creative process involves focusing my attention on the “voice” of a location and the objects within it. I often do this by removing myself from my routine, that which is visually familiar to me. I travel extensively to paint in remote locations, most recently focused on New Mexico, the Sierra, and the great deserts. I am inspired by vast open spaces, and the primordial landforms I find there. Once I am ensconced in a place, I quiet down and begin to take in the mood. I am attracted to contrasts and assertive shapes, and clear, bold colors. I observe the local atmosphere, the particular way a place and its objects are expressed. I channel the unique content of the place in my painting, quickly composing a gestural drawing, often using the broad side of the pastel sticks, in a physical, almost calisthenic application. I strive to express my emotional response through bold, gestural, colorful strokes, and I leave these strokes as is, trying not to refine them excessively in the finished piece. -Pastels - set of soft pastels, minimum of 60 colors, possible brands include Terry Ludwig (Molly�s favorite), Unison, Sennelier, Schminke, Rembrandt. -Mounting surface � gator board, light plywood or other portable hard surface which can be used with clips or tape, at least a few inches larger all around than the paper. -An excellent assortment of pastels can be purchased from Dakota Pastels www.dakotapastels.com or Rochester Art Supply- www.fineartstore.com. Pastels are also available from www.dickblick.com, www.cheapjoes.com, www.jerrysartarama.com. -I use a medium sized Heilman Box, www.heilmandesigns.com, and a Heilman easel, and place it on a tripod, or on a rolling cart that opens into a table. -I also have a backpack size Heilman box. These boxes are divided into compartments, allowing you to arrange the pastels by value. Most have a tripod attachment. If you have the tripod, you will not need the table or tray. For our workshop you may just use a light field easel to hold drawing board and pastels, and carry a light aluminum folding table, and use the pastels directly from the box. Make sure you have all your pastels visible at once, and not divided up into many boxes. A good travel easel is Windsor & Newton�s Bristol easel, or any of the Jullian or French Easels. Please email me if you have any questions or problems with supplies (artist@MollyLipsher.com).